WEST LAFAYETTE, Ind. — A leading international researcher at Purdue University who has studied how psychedelic drugs act in the brain is the featured speaker at the next Science on Tap event Thursday (May 19) in downtown Lafayette. The Science on Tap event is free and open to the public to those ages 21 or older. In his research, Nichols makes chemicals similar to ecstasy and LSD that are supposed to help explain how parts of the brain function. He then publishes the results for other scientists in academic journals, hoping the work leads to treatments for depression or Parkinson’s disease. But for years, Nichols has found himself in an ethical dilemma because of the overdose-related deaths that have stemmed from those who hijack his work to make cheap and marginally legal recreational street drugs. In the past year, the 66-year-old Purdue professor has been speaking out about the ethical struggle stemming from his work as a brain researcher. “It seems there are people out there willing to try just about anything to get high,” Nichols said. His research concentrates on the basic neurochemical serotonin. Nichols estimates that at least five of his compounds – out of hundreds he has developed over four decades – have been turned into street drugs. 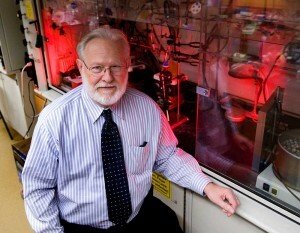 Since he began his graduate studies in 1969, Nichols has focused on how the structure of a molecule affects its biological activity. He has published more than 280 scientific papers and has been invited to present seminars at numerous national and international meetings. Sponsors for Nichols’ Science on Tap talk are Discovery Park, Purdue’s College of Pharmacy, and the Department of Medicinal Chemistry and Molecular Pharmacology, which is providing funding for food at the event. Science on Tap, led by Purdue postdoctoral students John Paderi, Patrick Dolan and Kate Stuart, provides faculty from Purdue the opportunity to share their research activities in an informal setting, touching on subjects and providing presentations that are designed to appeal to a more general audience. Attendance at the monthly event has averaged 80 during the program’s first year.